Eco Friendly Lids for our Cod Cups. 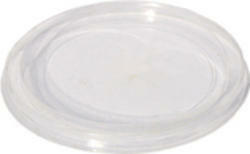 These handy lids are 100% compostable and biodegradable. Made from corn, the fit perfectly and are of the highest quality. Place to insert straw right in the middle. Great with Cup and Biodegradable Straw! "Compostable" So Everyone Knows How Green You Are!